NCBI Head Office will close for Christmas at lunchtime on Friday 21st of December. We will re-open on Tuesday 2rd of January as usual. We would like to take this opportunity to wish everyone a very merry Christmas and a prosperous new year! NCBI Quiz Night at Fairview! NCBI Fairview are hosting their quiz night this Thursday 6th December from 8pm at Bru Bar, Fairview, Dublin. It’s €5 pp, 4-6 persons per table. There will be spot prizes and a raffle on the night too. According to the 2016 census, there are 15, 281 people with sight loss living in county Dublin. 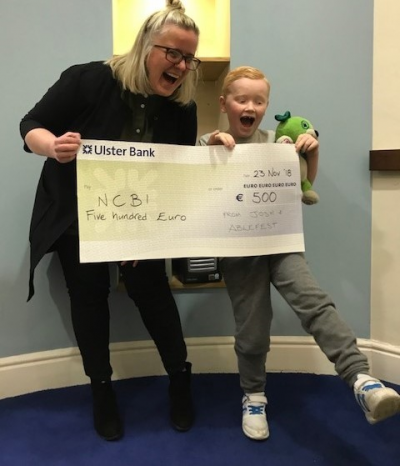 All proceeds raised …Read More about NCBI Quiz Night at Fairview! Tomorrow night, Wednesday 28th November, our NCBI Charity Shop Rathmines are hosting their quiz night from 7:30pm at Blackbird, Rathmines. It’s €5 pp, 4-6 persons per table. There will be spot prizes and a raffle on the night with all proceeds going to the provision and delivery of NCBI services. Register your team by contacting …Read More about Rathmines Quiz Night! Giving it socks for NCBI! We had a very special visitor in our office on Friday. Josh, his teddy Scout and his parents came in with a €500 cheque. This money was fundraised at Ablefest, a music festival his Dad and their friends put together this summer, for people and families with disabilities. It sounded like so much fun and …Read More about Giving it socks for NCBI!